Thought your high security prison was good enough? Think again. Introversion Software have given Prison Architect inmates a few more tricks to escape with update 15. If you're housing a few smart criminals, they may now attempt to hijack certain types of trucks. If a truck is left sitting by the side of the road, they might attempt to hijack it and beat up the poor driver trying to earn a living. To help with this, there's a new Road Barrier object (basically a strong metal gate) which closes during a lockdown. Alternatively, you can place armed guards around to stop them getting into the truck in the first place. Also, since Introversion added in rope escapes in update 14, you can now as of this update put barbed wire on top of walls. It might not actually stop them in their tracks though and it can injure them but it might be enough to slow them down to be captured. They also gained the ability to climb trees, so you might not want any trees near your walls, although they can be knocked off the tree by guards too. Might have to jump back in with the last few updates, since they've introduced some really interesting AI features like the above it certainly will make me re-think some designs I used. Really fantastic to see Prison Architect continue to be updated nearly three years after the official release. Well worth taking a look, love the game. Find it on Humble Store, GOG and Steam. No update video??? WTF? Can't be true. No way. Those videos mainly motivated me to spent 876 hours in this game during Alpha/Beta. An update without an video is no update! Am i the only one who thinks this game and Escapists should merge together ? Kinda how Dwarf Fortress has the standard and adventure mode. Would be cool to escape from a prison you built. razing32 Am i the only one who thinks this game and Escapists should merge together ? This is such a great game. The campaign or tutorial, kind of the same thing is outstanding and immersive. Warden mode is a ton of fun for replay value as well. I absolutely adore this game, and thrilled that the development continues at a good pace. 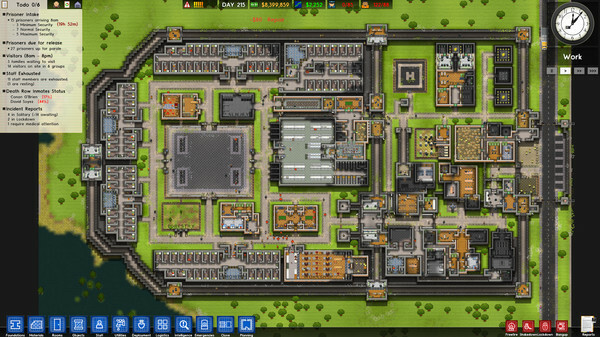 Unfortunately the lack of a real campaign makes Prison Architect boring.